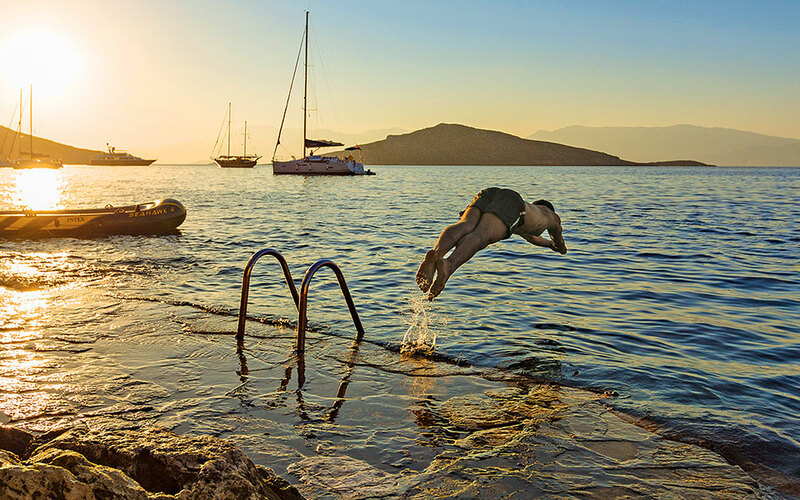 Swimming in the harbor of Halki. 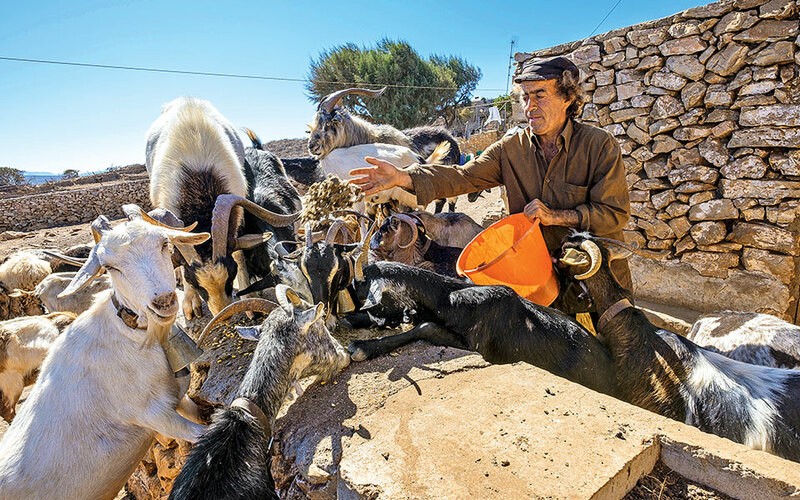 This account is part of a series of insider takes on the islands of the Dodecanese. For more on these islands, click here. If you’re one of the 250 permanent residents of Halki, you get the impression that you live on two different islands: the one of the difficult winter months that is frequently cut off due to bad weather gives way to a long-lasting summer paradise where the sea is inviting until November! July and August are the best times for the youth, groups of friends and the festivities of the islands traditional panigyria. The population of residents doubles, and almost 5 times as many tourists arrive. 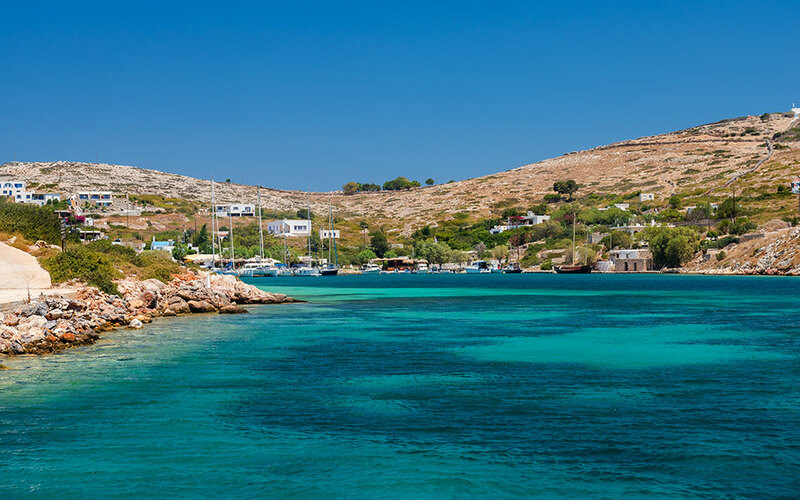 May and June – and especially the months of the autumn are when Halki shows off its best feature; the perfectly colored landscape and the crystalline waters invite you out into nature for hikes, boat rides and impromptu al fresco parties. The only area inhabited today is Imborios; its balconies and courtyards with their pebble mosaics, and the grand two-story homes that are literally lapped by the waves create a setting of island grandeur. Here you have the sense that you are living in another era, one that is far from the noise of the cities, without cars, without people hurrying in their every move. You can even swim in the port meaning that you need not go anywhere else. 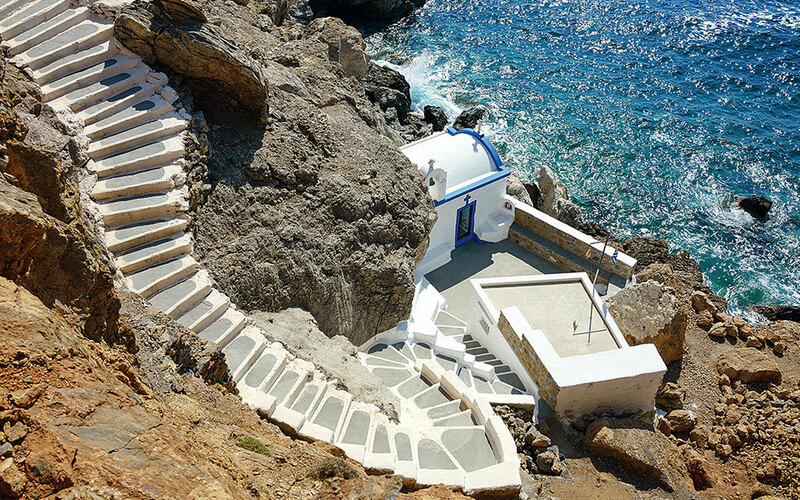 Aside from the three beaches easily accessible by foot – Pontamos, Ftenagia and Kania – there are others that can only be reached by sea or via long and difficult hikes. The landscape rewards the extra effort. To eat, you will choose your taverna depending on the angle from which you would like to admire the island. You will try local pasta, goat, fakorizo (lentils and rice) and dolmades (stuffed vine leaves). 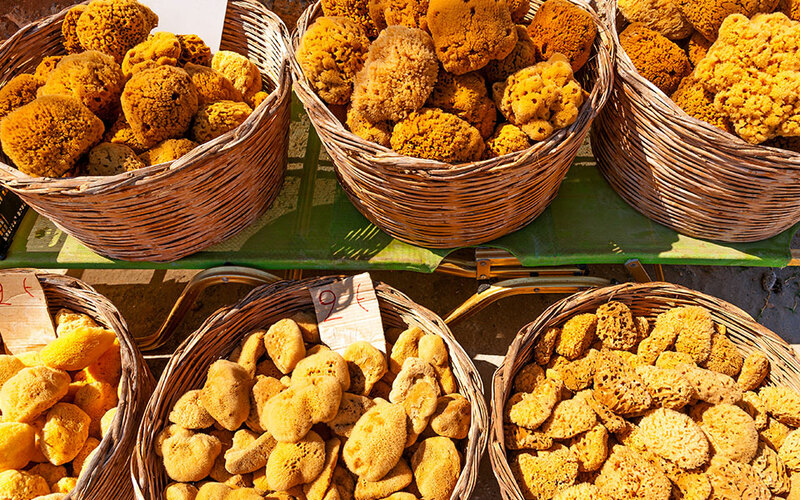 As a souvenir you will buy local thyme honey, traditional biscuits and handmade sweets. If a tourist asked me to give him a tour, I would take him to the pretty, old and well-maintained churches with their impressive murals in Palaio Horio which was inhabited from antiquity until the mid-20th century and today is full of ruins, as well as to the Castle of the Knights of St. John from the 15th – 16th century. From there you can enjoy a unique view towards Karpathos, Rhodes, Alimia and the cluster of islets to the east. I would also take them to the southern side of Halki, to the natural sea cave which has two entrances and impressive waters. Many are those who come for a two-day excursion from Rhodes and immediately start desperately looking for a room for the rest of their vacation. The island enchants you. My family comes from the island, but I was born and raised in Athens. 8 years ago I moved permanently to Halki – it was a bold leap and a challenge, but I succeeded and feel fortunate. Arkoi is a breath of life in the Aegean and has been since ancient times, when the name of the island was Akritis and Narkoi. It is a dream island for all and certainly for us, its 40 residents who are akrites (people living in remote areas) and full of life. The island falls into a winter slumber for most of the year and reawakens in the summer, with its 3 tavernas and one cafe. We have a lot of tourism and a lot of boats, stunning beaches such as famous Tiganakia and the quiet Limnari. The first establishment to open was a cafe and grocery, Aktaio. Its founder was Bouzouki, as Theologos Melianos was known. But behind every man there is a great woman. Her name was Pandelenia. She did everything including raise 6 kids. The youngest of them, Manolis Melianos, known as Trypas, is me. I turned the old cafe into a good taverna with tasty food, good music and high spirits, which is also known as Trypas. All of us here all pull in the same direction and our vision is one: to keep this beautiful island alive with its wonderful residents. Sponges on sale at the local market of Pserimos. The first thing that you need to know about Pserimos is that here you experience ultimate freedom. You don’t need a vehicle, nor many clothes, not even shoes – everyone walks around barefoot. We also have a very nice, pristine beach in front of the village. This is where everything happens. You get to the others either by boat or by footpath. Don’t imagine anything difficult – a 20-minute walk at most. I think that the nicest thing you can do is to enjoy your breakfast and then head to beaches on the other side of the island (Vathis and Panaghia Grafiotissa), in order to avoid the crowds in the village at around 11-12 in the morning when the tourist boats from Kos arrive. Enjoy your swim and come back in the afternoon. At that time the village is a paradise, with a few groups and incredible colors as the sun sets. Afterwards sit at one of the nine establishments. We have very fresh fish and generally produce most of the products here. I use my own cheese, meat and oil – our olive grove has 7,000 trees and produces exceptional extra virgin olive oil. If you would like a drink there is a bar with a pool at the hotel Pserimos Village, the only accommodation that stands out from the rooms to rent. Alternatively drink it on the beach, especially when there is a full moon. The church of Aghios Georgios is built in amongst the rocks on Telendos. If you come to Telendos for the first time, I will take you to Aghios Georgios, to show you the theater. I love this part of my island very much. This very small little church is built inside the rocks, right next to the sea. We’ll need to go down some very steep steps next to the cliff. I really like it when I’m there and believe that every visitor needs to go there to live this unique experience. A bit further on there is a very big ancient theater. A lot of performances must have been held there. I like spending my afternoons there looking at the amazing view. My island is Telendos. It is my island because I have lived here ever since I can remember. My favorite place is the beach of Hohlakas, which is on the back side of the island. I can see the sunset there, as well as the face of the princess in the rocks on the mountain opposite. There is a legend that says that the mountain took the shape of a princess who was killed jumping from there, because she believed that the man she loved had drowned on his way to meet her. When she saw his candle extinguished by a wave, she was lost, but left her face behind forever. It is the prettiest place that I have ever seen in my life. *Charalambos and Aphrodite are the only students at the elementary school of Telendos. Almost all of the beaches on Leipsi are protected from the meltemi winds. “How nice that you live here,” the tourists tell us. Of course, they haven’t come in the winter. Now it is spring and everything is sweeter. The Italians, Brits and Germans also return – those who have houses on “the mythical island of Calypso”. The first tourists also arrive with yachts from Leros and Patmos. For its size (just 12 square kilometers), Leipsi has good infrastructure. But we will never set up umbrellas and sun loungers – you can find shade under the tamarisk trees. The island has about 15 beaches and almost all of them are protected from the meltemi winds. 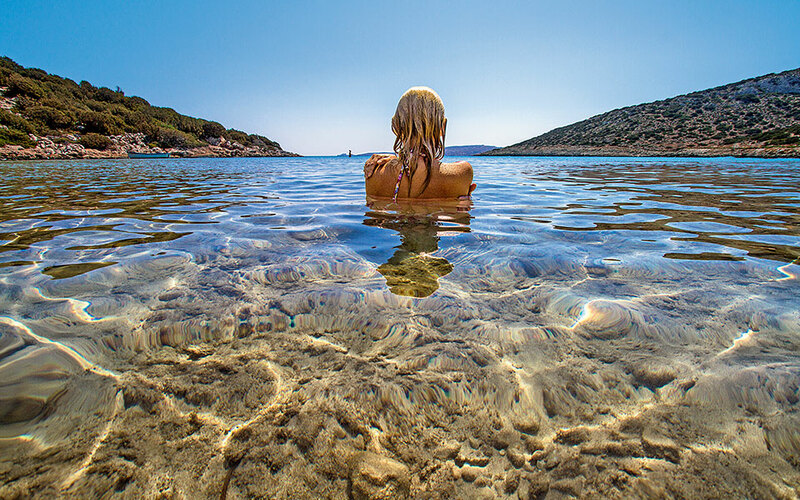 At Platy Gialos the water almost looks fake – like a salty swimming pool. You walk 50m from the shore and it is still shallow – that beach is like our own piece of the Carribean. Following the stone-paved path from Kato Koimisi to Ano Koimisi, look up to spot Audouin’s gulls, the seabirds with the red beaks that honor us by flying here. Wild rabbits and partridges roam freely. The locals will cut you some figs and grapes, and at the tavernas you’ll have stuffed goat and fresh squid. At the winery that I opened in 2010 with my partner Nikos Gryllis, the sweet wine of Leipsi – Fokiano – is even nicer if you drink it at sunset. At night, the cars don’t pass by the village around the port and so the kids play freely. At the the panigyris of the Savior (August 6) and for Panaghia tou Harou (August 22), we will celebrate together. Here there are no locals and outsiders. Marathi island, an ultimate getaway with 5 permanent residents. Marathi is an island that covers 33.5 hectares and has 5 permanent residents. Two of them are my parents. They first came in 1977 and opened the taverna. Then the island resembled a land for exiles. I remember that we would carry water in barrels with a caique from Arkoi. Until 2010 there there was no electricity on the island – we had generators. 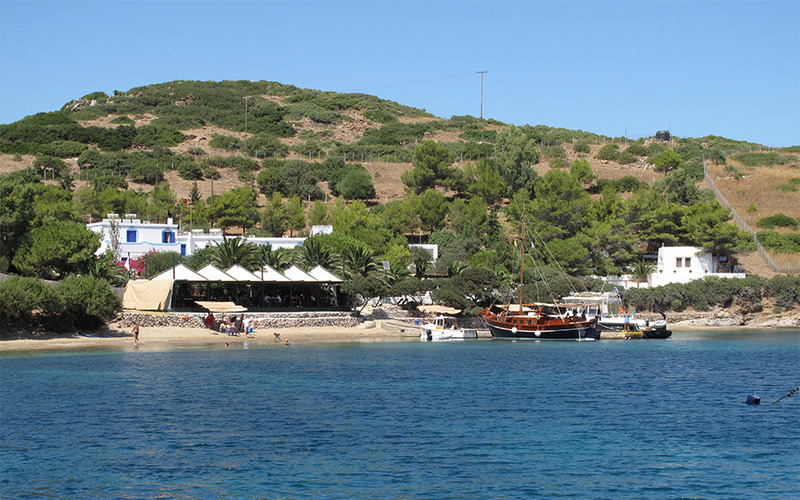 Today there are three houses on the island, about 20 rooms and three good tavernas. In one of these, my mother Katina cooks everything you could imagine using ingredients from the surrounding islands: Leros, Leipsi, Arkoi, Makronisi and Samos. She always finds the time to bake bread and to make handmade jams for guests. They are travelers who love serenity, to read and want to rest. They move around the island on foot, they swim in the single beach or dive off the rocks, they do yoga, they relax in the hammock in the garden, in the evenings they drink cocktails and listen to music at the bar Luv which is right by the sea. Until the end of July the island is a very private affair – not that it is chaos in August, but the number of tourist boats increases bringing visitors to eat. In the evenings the pace slows down. We haven’t put WiFi in the taverna nor in the rooms. Often when the guests are eating I shout to them, “Run the moon is rising,” and everyone goes down to the small wooden pier for that magical moment.